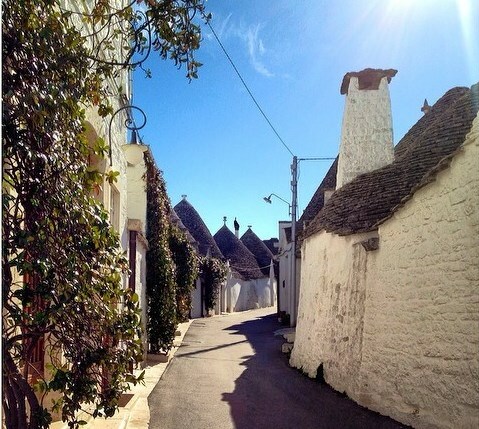 One of the most interesting sites in Puglia is the small town of Alberobello, also known as the trullo town. 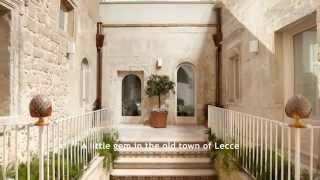 A trullo is a small limestone house found in the southern region of Puglia, made with drywall (mortarless) construction, a prehistoric building technique still in use in this region. 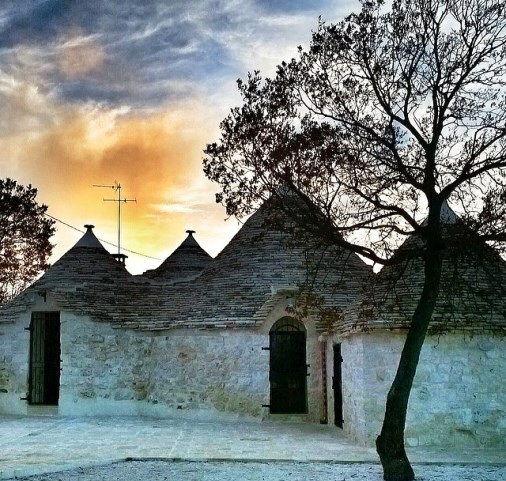 Trulli (the plural of trullo) are made of roughly worked limestone boulders collected from neighboring fields. They feature conical roofs built up of corbelled limestone slabs. 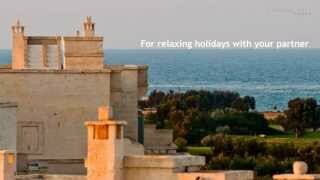 In the historic center of Alberobello all the houses, shops, restaurants, and even the church are trullos. This charming village of Alberobello was named a Unesco World Heritage Site in 1996 because it is an exceptional example of a form of building construction deriving from prehistoric techniques that have survived intact and are still functioning in the modern world. 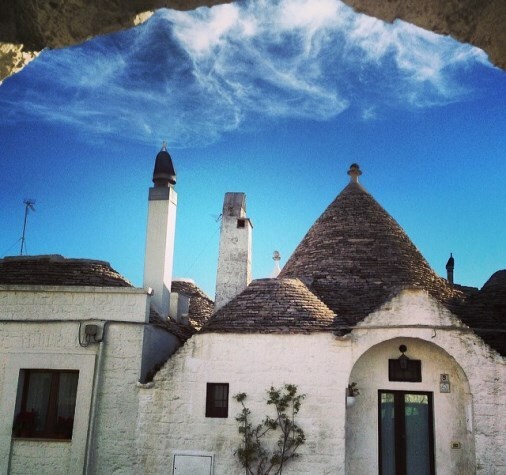 Many trullo have pagan or magical signs whitewashed onto their roofs. There are lots of theories about the meanings of these symbols – which include planetary symbols, the malocchio (evil eye), the cross, a heart, a star and crescent, or quite a few others. There are books available in the town's shops which try to explain them - but truly the origins of the symbols are lost in the mists of time. Trullos magically seem larger inside than what you might imagine. The walls are very thick, providing a cool environment in hot weather and insulating against the cold in the winter. The vast majority of trulli have one room under each conical roof: a multiroomed trullo house has many cones representing a room each. In the past, children would sleep in alcoves made in the wall with curtains hung in front. What is also a mystery is why, indeed, this particular style of construction developed here, and only here. It is not found anywhere else in the world, except for those places where people from here have built themselves a trullo, perhaps to remind themselves of home. Legend has it that due to a high tax on property back in the Middle Ages, the people of the Itria Valley created these roofs of limestone slabs piled one atop the other without any mortar holding them together so that they could be dismantled when tax inspectors were in the area. Apparently, the townsfolk were taxed per roof . . . no roof, no tax. Alberobello makes a great day trip if you are in the area. 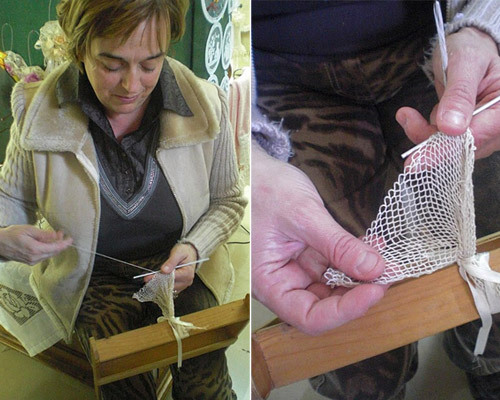 There are lots of shops selling local crafts, such as miniature ceramic trullos or beautiful handmade crocheted linens. Don't forget to sneak down the side streets, too, where you can see how the townspeople really live their lives in this fairy-tale town.